Project to create audiobooks in many languages. 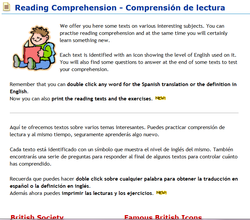 Find websites to practise you reading skills here. What you don't have to do in an oral exam. Do not use literal expressions from one language into another. They are fun but not English language. For some examples on this, you can read on or during summer holidays 2 books by F. Lopez Socasau and Ochoa Speaking in Silver and From lost to the River. Not advisable before an oral exam. If you want to know how British people see themselves, you should read `How to be an alien' by George Mikes. It is available in our classroom library for pre-intermediate students or you can read it on http://f2.org/humour/howalien.html as well. You'll find out that talking about the weather is their favourite topic, they love tea, queuing, and so on. You can find a good catalogue of postcards explaining Bristish manners here: http://www.lgpcards.com/cards-1.html.